Raul Garreta, co-founder and CEO of MonkeyLearn, is a hi-tech entrepreneur specialized in the application of Artificial Intelligence (AI) to the Internet industry, in particular, Machine Learning (algorithms that allow computers to automatically learn to perform a task from data) and Natural Language Processing (NLP, algorithms that allow computers to process and understand written and spoken natural languages). In 2013 he co-founded MonkeyLearn, a cloud platform to democratize Machine Learning technologies. MonkeyLearn allows software developers and SMEs to easily extract and classify information from text within their applications. Previously, he co-founded Tryolabs in 2009, a company that provides professional services to help US companies building products that leverage Artificial Intelligence technologies. 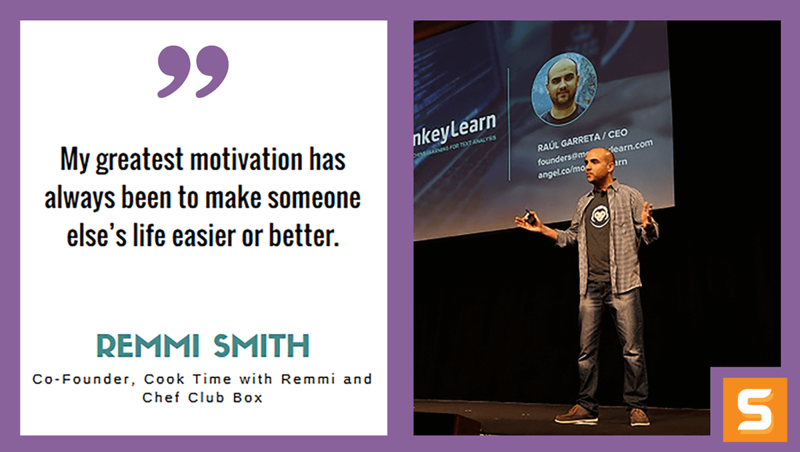 In this interview, Raul talks about his passion for Artificial Intelligence (AI) and how he avoids reinventing the wheel by providing a more simple solution for his team - thus, MonkeyLearn was born. Learn from Raul's insight on entrepreneurship, how to keep growing your business and how to handle failures. His top advice to new entrepreneurs - read stories of other entrepreneurs. If you're looking to stay up to date on the coolest tech, be sure to follow this guy on Twitter! What ignited the spark in you to start a business? Where did the idea for MonkeyLearn come from? I've been related to Machine Learning both in academia and industry since 2005, AI blew my mind since the beginning. Through these years, every time I had to build a solution myself or with our team, I always felt I had to reinvent the wheel. I felt that it must be an easier way to solve NLP and ML related problems. Besides, Machine Learning is a field that has been only available to experts and is not a technology stack that every developer can use. We created MonkeyLearn to solve that, to democratize Machine Learning and Natural Language Processing technologies, to enable the average software developer and SMBs to actually build intelligent applications. You have control on what you want to build, how to spend your time, what to focus on, and how to change the world. How do you generate new ideas for MonkeyLearn to keep growing? Is there a secret that you have figured out over the years? First, as with any company, you must be super enthusiast, love what you do. In that scenario, you'll be always researching, reading, thinking of new ideas on how to improve what you're building, just because you enjoy it, it's fun. Get a great team to join that passion and you're set. You'll find lots of ways to keep your inspiration flowing on a daily basis. Best way I think is to start small and grow organically, things must happen at the right speed. I don't believe in magic from PR, it's a good tool at the right moment, but it won't magically get new users or customers. As Paul Graham says, initially do things that don't scale, that means to me, work closely with a bunch of customers, adapt your vision and product until you find the desired product-market fit, then customers should come organically and you can scale. In our case, we are 100% inbound, we attract users with good content and those that keep engaged will convert to customers at the right time. I would not say fear, but as any other business owner, keep a close eye on your financials, your team enthusiasm and your customer experience. Who has been your greatest influencer along your entrepreneurial journey? How did they shape MonkeyLearn? I don't think I have a “greatest influencer”, but it's much of following and reading a lot of influencers. Paul Graham: practical and real advice on how to build a startup. Elon Musk: there are no limits on what a man can build. Steve Jobs: build products that delight people. It's ok to see what other companies/entrepreneurs are doing, but among all, think out of the box. Have you faced any failures with MonkeyLearn? How did you overcome it? I think everyday you have wins and loses, the entrepreneurial journey is a rollercoaster with ups and downs. What will keep you moving forward is your passion and love of what you're building. Just carry on. Lots of good advice, the first that comes to my mind: “hire the best people”. I don't remember a particular bad advice, but what I would say is, know how to use the advice, you may receive lots of advices from great people that can contradict. Know what to take and what to discard. At the end of the day, you have the vision, you know your business more than anybody, you have to make your own decisions. Go to meetups, conferences, talks. California is the best place to be if you want to nurture from other's experience. Read about startups (both from the business and product/tech point of view). Read stories of other entrepreneurs. Meet with people and start making relations with potential partners. Having ideas is great, but at the end of the day what matters most is team and execution. Validate your ideas, tell your idea to people, get feedback. If after a maturation time you still have enthusiasm and no major pitfalls, then it could be a good candidate to think about building an MVP.